Pack light, travel well. When it comes to having a memorable travel experience in Cuba, you want to make sure that anything can happen—that means not having to worry about excess baggage weighing you down when you need to hop on a bus to Cienfuegos. Stay flexible, agile, and fancy-free by keeping all your necessities in a carry-on. You don’t have to sacrifice comfort to travel light—we promise. Here’s our packing guide so you can have everything you need for your Cuban adventure in a carry on. You’ve heard it once, and you’ll hear it again from any packing guide: make sure the clothes you pack are versatile and can be easily mixed and matched. Basic styles in neutral colors work best. Think tee shirts, plain tank tops, a pair of jean shorts, a pair of cotton pants, one dress/buttoned shirt, one pair of sandals, a pair of sneakers, and a light sweater or jacket to round out your lineup. You shouldn’t need any more than four shirts and two pairs of bottoms total as a general rule of thumb. 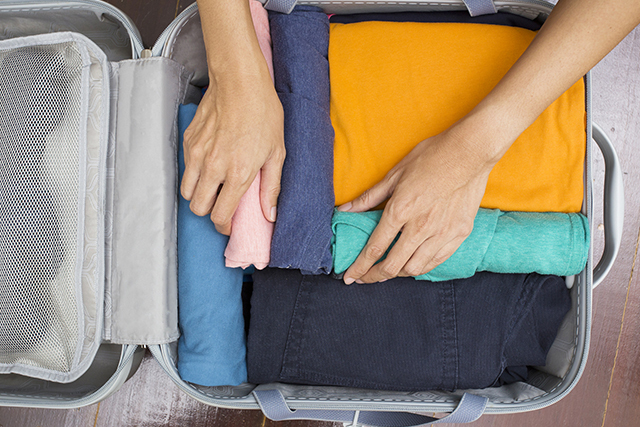 The easiest way to make the most of the space in your carry on is to roll all of your clothes up. Put socks and tee shirts inside your shoes and stack rolled up shirts and shorts on top of one another. Aside from conserving space, this also keeps your clothes from getting wrinkled in the island humidity. Repeat after us: travel size toiletries. Not only do they save space, but they save you time going through security by ensuring that everything you have packed is within liquid-allowance regulations. Bring several travel size bottles of sunscreen and bug repellent to make sure you have enough for the entirety of your trip. Then, make toothpaste “pills” to save space. Before your trip, take a tube of toothpaste and squeeze pea-sized dots onto a paper plate. Sprinkle the “pills” with baking soda to keep them from melting later and let them sit out and harden overnight. Scrape them off the plate, put them in a sandwich bag, and enjoy your single-use toothpaste pills! Additionally, pack some baby powder. It can be used as a dry shampoo, moisturizer, deodorizer, stain remover, and more. Forget a jacket and end up cold at night? Need strappy sandals for a day at the beach but forgot your favorite pair at home? Don’t worry, this is your opportunity to take part in the local apparel scene. Buy yourself a Cuban shawl or some handmade leather sandals and you’ll have a utilitarian souvenir that allows you to fit right in with the locals. Have you been to Cuba before? Tell us what YOU would pack for a trip to Cuba and share your thoughts in the comments below. Do hotels provide hairdryers? Do the casa particulars? (I doubt it.) Thanks for all the good info. Hi Nancy, thanks for the question! Most hotels that insightCuba guests stay at do provide hairdryers. Check out our hotels page for more info. As for the casa particulars, the only way to tell would be to get in touch with the host family, however we reccommend bringing your own to be on the safe side. Look forward to traveling with you soon! dont forget bathing suit. Cover up. SPF Hat. Water shoes. For places with rock and coral. Most beaches have plentiful sand. But some don't but are beautiful as well. All those items you won't find ready available or to your liking. Be prepare and have a good trip. And from April to Sept is HOT HOTand humid!julia. (Born in Cuba). Visited my land and family after 50 years. Loved it! Your tips are great for traveling to other destinations, but not to Cuba. Not if you have family there. Sadly for most Cubans with family in the island it is impossible to travel light as most of the stuff we take are gifts, and bare essentiaals for the family, so we end up taking huge suitcases.